Claymore Straker is a fugitive with a price on his head. Wanted by the CIA for acts of terrorism he did not commit, his best friend has just been murdered and Rania, the woman he loves, has disappeared. As his pursuers close in, Clay follows Rania to Istanbul and then Cyprus, where he is drawn into a violent struggle between the Russian mafia, Greek Cypriot extremists, and Turkish developers cashing in on the tourism boom. As the island of love descends into chaos, and the horrific truth is unveiled, Clay must call on every ounce of skill to save Rania and end unimaginable destruction being wrought in the name of profit. 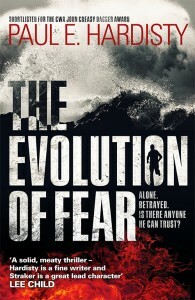 Gripping, exhilarating and, above all, frighteningly realistic, The Evolution of Fear is a startling, eye-opening read that demands the question: How much is truth, and how much is fiction?